Nail Tek Quicken Fast Drying Top Coat. Available in .50 fl. oz. and 2 fl. oz. sizes. 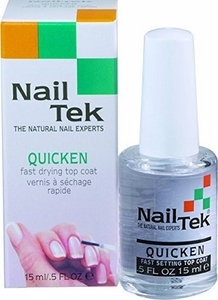 Ultra-fast drying top coat especially formulated for natural nails. This unique formulation sets polish faster and provides high gloss shine without sacrificing polish retention. Quicken prevents nail polish from chipping and gets you out of the house or salon quickly.